Samsung Electronics, the world leader in advanced memory technology, today announced that it is introducing the industry’s first embedded Universal Flash Storage (eUFS) solution for use in next-generation automotive applications. Consisting of 128-gigabyte (GB) and 64GB versions, the new eUFS solution has been designed for advanced driver-assistance systems (ADAS), next-generation dashboards and infotainment systems that provide comprehensive connected features for drivers and passengers worldwide. 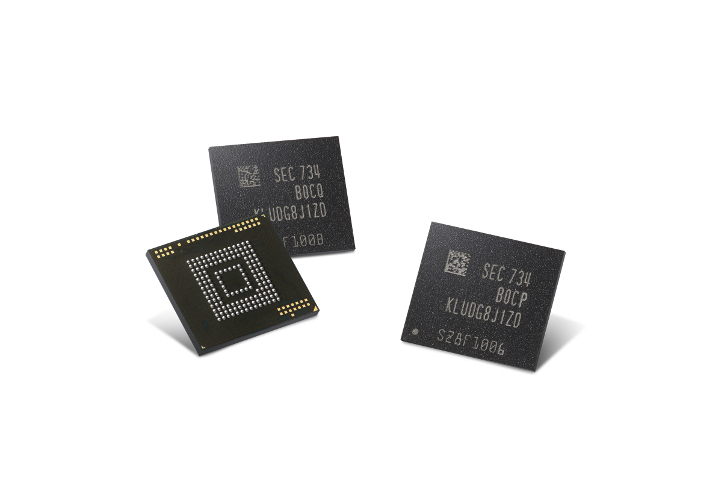 Embedded UFS solutions have been used in a variety of mobile applications since early 2015, when Samsung introduced 128GB embedded memory based on the JEDEC UFS 2.0 standard, for the first time in the industry. Since then, the high performance and proven quality of UFS has led to its wide adoption in large numbers of mobile devices from flagship smartphones initially, to also now in mid-market smartphones. Configured on the most up-to-date UFS standard (JEDEC UFS 2.1), the new Samsung eUFSwill provide advanced data transfer speeds and robust data reliability. For example, the new Samsung 128GB eUFS can read data at up to 850 megabytes per second (MB/s), which is approximately 3.4 times faster than the 250MB/s read speed of today’s eMMC 5.0 solutions. It also offers about 6.3 times faster random reading than eMMC at 45,000 IOPS. This will contribute to significantly enhanced performance in upcoming automotive infotainment systems for better managing audio content, increasing navigation responsiveness, accessing Internet-enabled traffic and weather reports, improving handling of hands-free voice commands, and speeding up rear-seat social media interplay. The new eUFS solution also features an efficient and reliable error-handling process, which is essential for next-generation in-vehicle infotainment. Based on the MIPI UniPro®* protocol, the eUFS enables detecting and recovering from I/O error on hardware layers, without having to involve the host software or restarting tasks. In addition, the Samsung eUFS supports advanced data refresh and temperature notification features for superior system reliability. The advanced data refresh operation allows a choice of refresh methods, and provides information on the refresh unit, frequency and progress for the host device’s control. This enables optimal data reliability, an essential element of automotive applications. When it comes to thermal management, the Samsung eUFS equips the temperature sensor inside the controller to enable highly reliable device temperature control. This prevents the eUFS from crossing well-defined upper and lower temperature boundaries, thereby allowing its NAND cells to flawlessly function within a tough automotive temperature environment. In light of the eUFS’ high performance and reliability, Samsung expects rapid adoption in the automotive market. Samsung will continue to satisfy the growing storage needs of leading automotive manufacturers by offering a variety of advanced eUFS lineups, while more thoroughly addressing the ever-increasing demand for leading-edge memory solutions in other market segments, too. * Editor’s Note: MIPI UniPro® is a general purpose, unified protocol that services a wide range of interface needs in mobile and connected devices. The interface was developed by the MIPI Alliance UniPro Working Group and has been available since 2007. Its current version, v1.61, was released in 2015. For more information, please visit https://mipi.org.